Steak dinner as you know it has officially been fancified with French flavors. 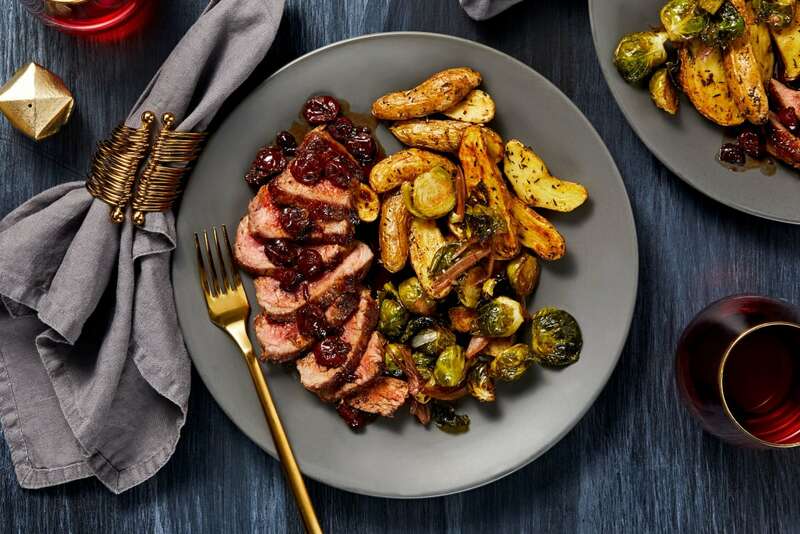 Le menu: Seared sirloin drizzled with a savory-sweet pan sauce. Roasted, Herbs de Provence-scented fingerlings. Tender Brussels sprouts and tangy, balsamic-roasted shallots. Beat that, Paris bistro! Adjust racks to upper and middle positions; preheat oven to 450 degrees. Wash and dry all produce. Halve potatoes lengthwise. 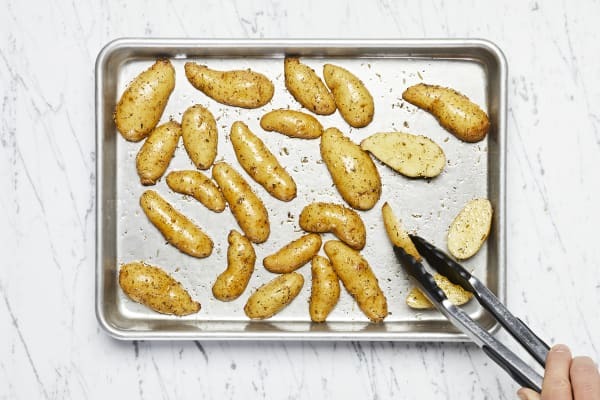 Toss potatoes, a large drizzle of olive oil, Herbes de Provence, salt, and pepper on a baking sheet. Arrange potatoes cut sides down. Halve, peel, and thinly slice shallot. 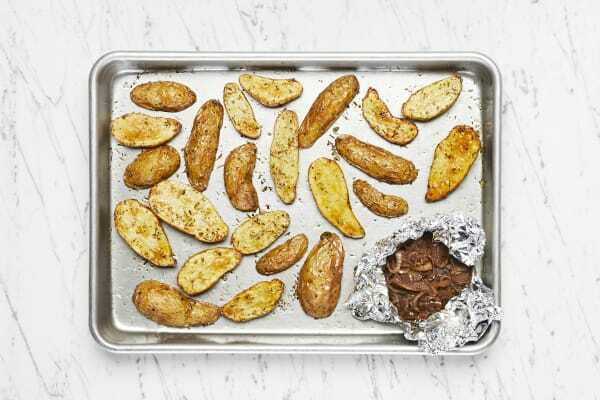 Toss on a piece of foil with a drizzle of olive oil, half the vinegar, salt, and pepper. Tightly seal into a packet and place on baking sheet with potatoes. Roast on middle rack until tender, about 30 minutes. Meanwhile, trim and halve Brussels sprouts. 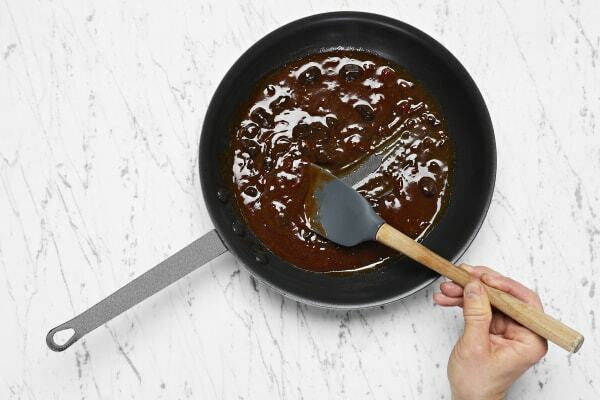 Toss on a separate baking sheet with a large drizzle of oil, salt, and pepper. Arrange cut sides down and roast on top rack until tender and slightly crispy, 15-20 minutes. Pat steak dry with paper towels; season all over with salt and pepper. Heat 1 TBSP olive oil in a large pan over medium-high heat. Add steak and cook until browned on first side, 4-7 minutes. Flip and add 1 TBSP butter to pan. Cook until steak reaches desired doneness, 4-7 minutes more. Turn off heat; remove from pan and set aside to rest. Heat a drizzle of olive oil in same pan over medium-high heat. Add cherries and cook until slightly softened, about 30 seconds. Stir in preserves, demi-glace, ¼ cup water, and remaining vinegar. Simmer until thickened, 3-5 minutes. Turn off heat. 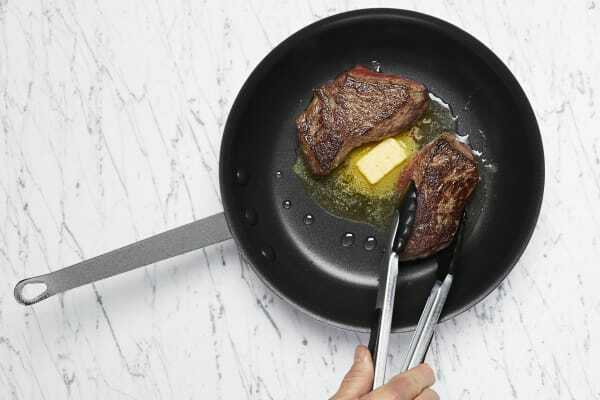 Stir in 1 TBSP butter and any resting juices from steak. Season with pepper. 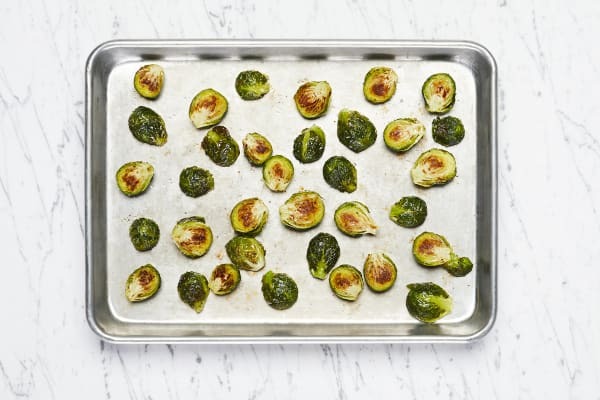 Toss together roasted Brussels sprouts and shallot (and any juices). Thinly slice steak against the grain. 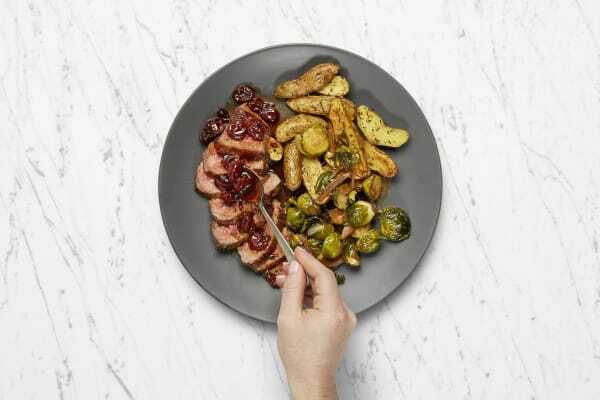 Divide Brussels sprouts, potatoes, and steak between plates. Top steak with sauce and serve.